But trust me, in 20 years you'll look back at photos of yourself and recall in a way you cant grasp now how much possibility lay before you and how fabulous you really looked.You're not as fat as you imagine. Dont worry about the future; or worry, but know that worrying is as effective as trying to solve an algebra equation by chewing bubblegum. The real troubles in your life are apt to be things that never crossed your worried mind; the kind that blindside you at 4 pm on some idle Tuesday. Dont waste your time on jealousy; sometimes you're ahead, sometimes you're behind the race is long, and in the end, its only with yourself. Dont feel guilty if you dont know what you want to do with your life; the most interesting people I know didnt know at 22 what they wanted to do with their lives, some of the most interesting 40 year olds I know still don't. May be youll marry, may be you wont, may be youll have children, maybeyou won't, may be you'll divorce at 40, may be youll dance the funky chicken on your 75th wedding anniversary. What ever you do, dont congratulate yourself too much or berate yourself either your choices are half chance, so are everybody elses. Dont be afraid of it, or what other people think of it, its the greatest instrument youll everown..
Dance even if you have no where to do it but in your own living room. Read the directions, even if you dont follow them. Get to know your parents, you never know when theyll be gone for good. Be nice to your siblings; they are the best link to your past and thepeople most likely to stick with you in the future. Live in New York City once, but leave before it makes you hard; livein Northern California once, but leave before it makes you soft. Accept certain inalienable truths, prices will rise, politicians will philander, you too will get old, and when you do youll fantasize that when you were young prices were reasonable, politicians werenoble and children respected their elders. Dont expect anyone else to support you. May be you have a trust fund,maybe you have a wealthy spouse; but you never know when either onemight run out. Dont mess too much with your hair, or by the time you're 40, it willlook 85. Be careful whose advice you buy, but, be patient with those who supply it. Advice is a form of nostalgia, dispensing it is a way offishing the past from the disposal, wiping it off, painting over the ugly parts and recycling it for more than its worth. 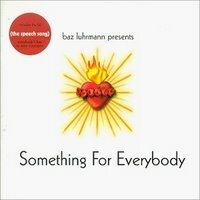 From the song "Everybody's Free (to wear sunscreen)" by Baz Luhrmann. Click here to listen to this beautiful song. Credit: http://www.nicamix.com/musica.html // Lyrics by Mary Schmich.